Rule us, unelected though they are. Stolen from us by these usurpers. 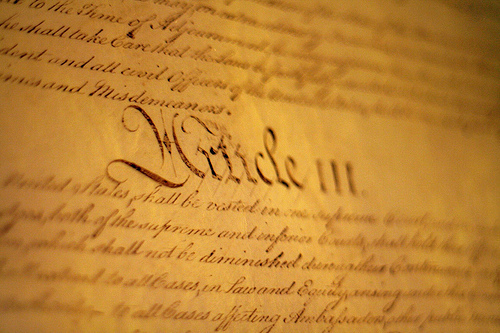 Poet's Notes: Nowhere in the Constitution does it allow that the Supreme Court has the power to declare laws unconstitutional. This is difficult to believe, as this power has been wrongfully wielded by the SCOTUS since Chief Justice John Marshall usurped it in 1803 in the case of Marbury v Madison. But, go ahead and look it up--this power was NOT granted to the courts by the Constitution. State supreme courts have similarly usurped this power at the state level, most recently and egregiously in Kansas. The Founding Fathers did NOT envision three coequal branches of government. On the contrary, the judicial branch was deliberately created to be weaker--much weaker--than the executive and legislative branches. The people were to be governed by elected representatives answerable to the people, not by unelected, life-time appointed judges. That we the people allow these USURPERS (note: examine the first letter of the first word of each line of the poem) to control us has baffled me since I first read the Constitution in the eighth grade.